Could This Short Devel Sixteen Video Be Actually Real?! If there is something that men go crazy for, that has to be cars and speed. Whenever a new car hits the market, we like to know every detail about it. This is exactly why there are many speculations even before the vehicle hits the road. The hype for certain cars is so massive that there is often a flood of fake photos and videos. Well, this is exactly why we take a look at this short Devel Sixteen video. You should be the judge and let us know whether it is fake or real. For those wondering why the hype is so big, this is the answer. 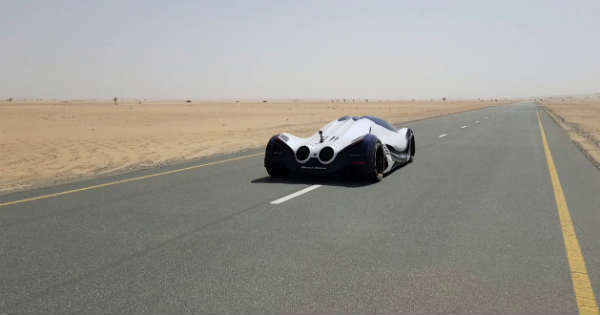 Namely, the Devel Sixteen was unveiled in Dubai over four years ago! It represents the future of cars and it is more than powerful. Namely, this beauty has over 5,000 HP, making it the most powerful car! Even though this is in fact a real functional car, we are still in doubt about its real power. Yes, the car does sound good, but the sound looks like a V8. Just to remind you, the Devel Sixteen should have quad-turbocharged V16 engine. If this is the actual sound, then we are not impressed at all. Based purely on these six seconds, we cannot say anything in particular. We can only remain calm and wait for the real thing. Nonetheless, this Devel Sixteen video does look awesome, but it is probably not the real car. The shape and the design of this monster are next level. It breaks the limit of a car looking cool. Even though there are many rumors about the car, no one has actually seen the real deal so far. Four years after, we are all short of some really awesome content! Before you leave, make sure to check out the unveiling of this hype car in Dubai!